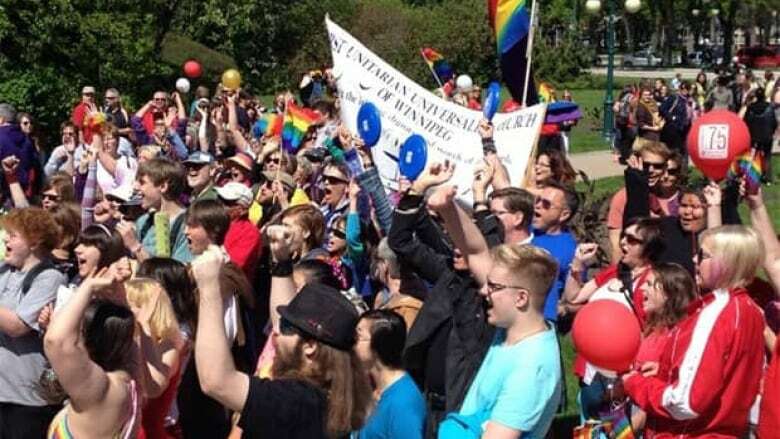 Downtown Winnipeg was a colourful and festive place Sunday as the 26th annual Pride Parade kicked off at the legislature building drawing thousands of people. Activities started at 11 a.m. with a rally and guest speakers followed by a two-kilometre parade, which begun at noon. "I know every one is really excited for the big day," said Jonathan Niemczak, the president of Pride Winnipeg. "It's like the LGBT Christmas, so everyone is really excited." The Pride Parade has been fixture in Winnipeg for nearly three decades. In 1987 about 250 people showed up to march, Sunday organizers expected a crowd of about 10,000 people to come out. I'm incredibly surprised," said Jade Vane, who came to Pride for the first time this year. "I didn't even know we had this big of a community in Winnipeg. It's just awesome to see so many people out here showing their pride," she said. For Mirella Aitken, Sunday marked the sixth time she's participated in the parade. "I come to support Winnipeg's gay community,"said Aitken. "I honour people like this. There's a lot of bullying out there and stuff like that and this is great, look at all the people. Like show your pride. Be proud of who you are," she said. After the parade the celebrations continued at The Forks. "We have live entertainment, all free," said Niemczak. "We have three headliners coming in, we also have a business fair called Pride Mart. We have our queer beer tent and we also have a kids area." The party continued into the night at the Met downtown.